The Magen David or Star of David as it's better known, is traditionally a six-pointed star made up of two triangles superimposed over each other. 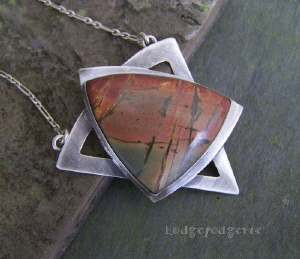 Whether used as protection against evil spirits or as a representation of faith, I've used a bit of artist license to create a simplistic, but very beautiful modern version of this ancient symbol. 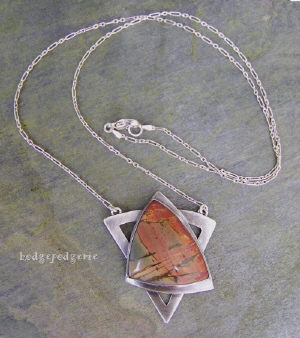 Totally hand-fabricated from Sterling silver, this pendant started out as simple Sterling silver sheet. 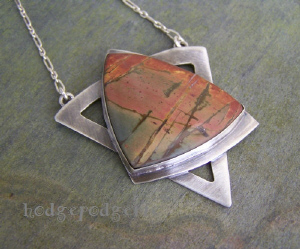 I've shaped, sawed and filed the silver to complement the triangle shape of the beautiful Cherry Creek Jasper stone. 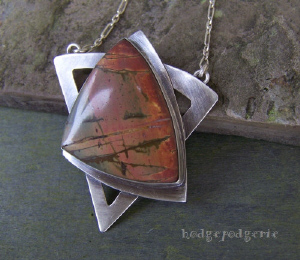 The necklace is 24-1/2 inches long with the pendant measuring 1-3/4 inches across and 1-7/8 inches in length. The Sterling silver cable chain is lightly textured and oxidized. 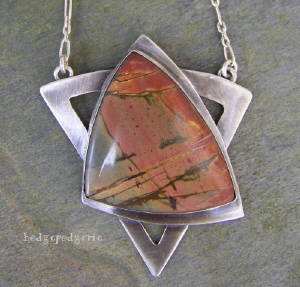 Return from "Magen David Necklace" page to "Necklace Gallery" page.